The XF 8.0 – 10.0t Diesel counterbalance forklift truck uses the latest technologies to provide superb performance. 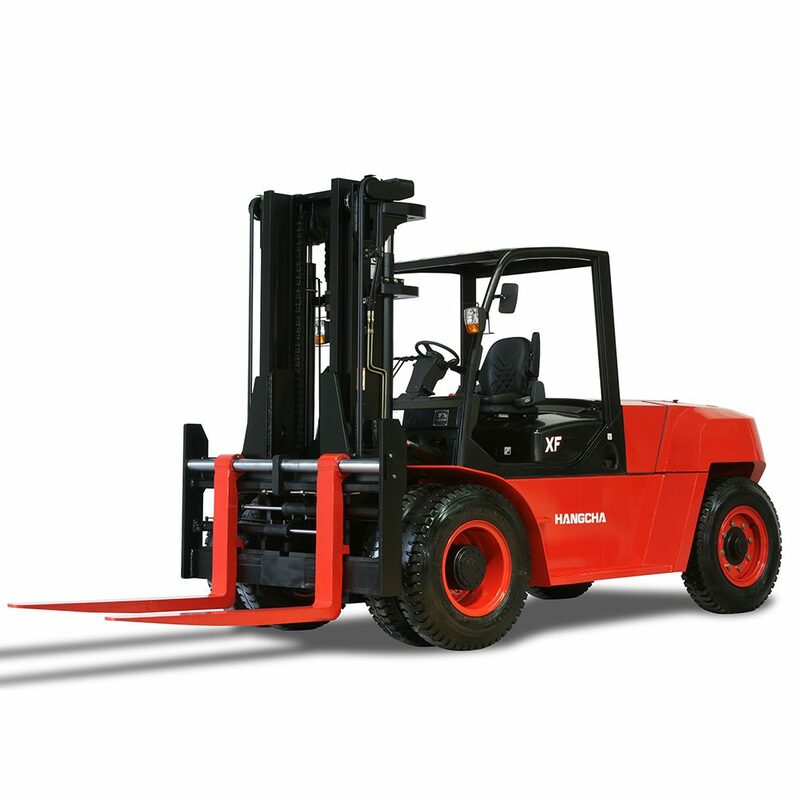 The high strength chassis, mast and front/rear axle makes the 8-10t one of the strongest forklift in the XF Series. 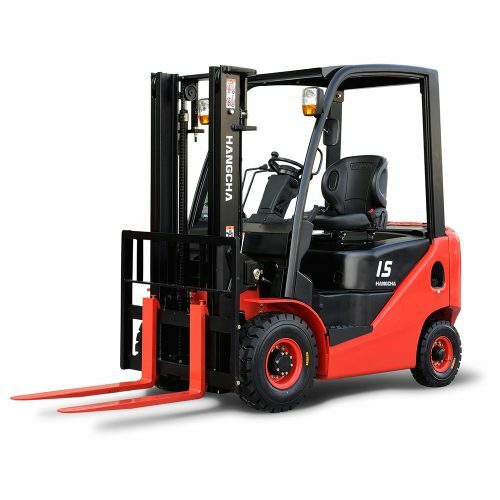 The latest forklift technologies are employed in this new XF series 8-10T internal combustion counterbalance forklift truck, which is the achievement of Hangcha after more than 30 years’ experience in the manufacture of forklifts. The optional electro-hydraulic proportional control system, the plated-fin type aluminum radiator, the small diameter steering wheel with tilt adjustment and the new design mast are employed to achieve comfortable and ergonomic operation. The shock absorption, the damping pad and the suspension seat are applied to reduce the vibration. All the diesel engines used by this machine are in compliance with EU-Exhaust Emission Regulation Stage-III. Eco-friendly materials are used in the non-asbestos brake shoe and the new type sealing gasket.The optimized exhaust and intake muffler and the noise shield technologies are employed to reduce the noise level to 3dB. 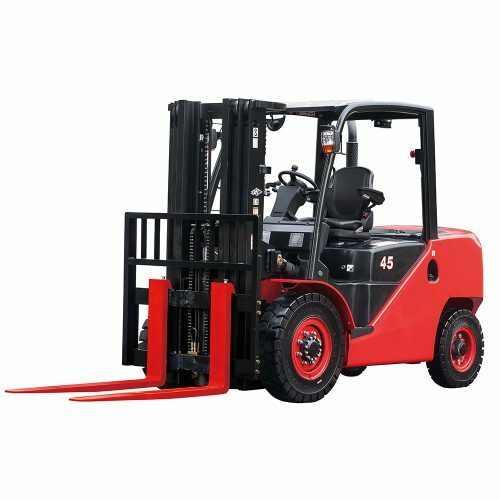 The dynamic load sensing hydraulic steering, the new efficiency lighting system and new type reflector are adopted in this 8-10T internal combustion counterbalance forklift truck to reduce the hydraulic loss and energy consumption, extend the service life of the truck, and increase its lifting speed. Moreover, by optimizing transmission design, the power train provides higher efficiency and faster driving speed. 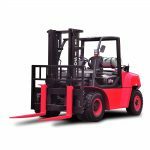 The high strength chassis, mast and front /rear axle are applied in this XF Series 8-10T internal combustion counterbalance forklift truck. All the controllers, relays, and safety fuses are installed in the controller box, which is free of water and dust. And the main electronic components are water proof. There are battery box and adiabatic plate installed between the battery and fuel tank so as to extend the battery’s working life. An energy accumulator is applied in the braking system of the vehicle. The seat sensor system combines the functions of lifting/tilting and traveling locking. The throttling device and the locking device of engine hood damper are adopted to ensure safety. The brake drum and the air filter are easy to be accessed and therefore easy to be replaced. Moreover, the engine oil level dipstick, filter of hydraulic, water separator are all easy to be accessed and checked. While the rear cover is opened, the front cover of the radiator automatically opens.